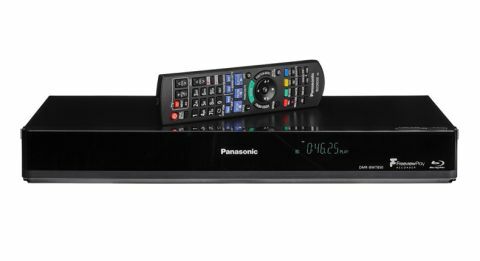 Panasonic DMR-BWT850 review | What Hi-Fi? The Panasonic DMR-BWT850 is a curious beast. Sure, it looks like just another Blu-ray player, but it’s actually a Blu-ray recorder. Yes, they still exist, but somehow it seems only Panasonic still makes them. ‘Recorder’ seems somewhat of an undersell, however. It plays Blu-rays and DVDs. It records live TV to its 1TB hard drive (up to 518 hours of programmes in SD or 259 hours of HD TV) which can then be ripped to Blu-rays and DVDs. It also serves as a TV set-top box, with the new Freeview Play service and a handful of key apps, and you can insert memory sticks and SD cards and watch/listen from there. Something with this many features must be broken down to its constituent parts, and we’ll start with the disc spinning. Treat it as a regular Blu-ray player and you won’t be disappointed. It is up to Panasonic’s typically high standards: solid disc tray mechanism, decent loading speeds, plus good sound and picture to boot. There’s even 3D, if you’re still using that. New for this year is 4K upscaling, although we’ve yet to find a need for this as 4K TVs do their own upscaling anyway. More useful is 4K playback, which lets you watch the Ultra HD videos and photos that you take yourself. You’ll need a compatible camera, but they are getting more common these days. There’s the DVR side of things, which is fairly standard. Choose something and click ‘record’ (or set a timer) and it does so. You get two tuners, so you can watch one programme while recording another, or just record two programmes. The TV Anywhere feature lets you view recorded programmes and live TV broadcasts on a smartphone or tablet over the internet. The service will work even if you’re abroad. It’s pretty neat, but it demands a good broadband connection. As for ripping discs, you’ll have to copy over existing records from your hard drive. You can’t burn programmes straight onto disc like we used to on VHS. The process of choosing a recording and burning it to disc is very simple, however, and fairly speedy. Finally, we get to Freeview Play. It’s not available out of the box – make sure you download the latest software updates. Freeview Play offers the same as YouView, an EPG (electronic programme guide) with the ability to scroll back seven days. Notice something you missed? Click on it and it will open provided it belongs to one of the main catch-up apps: BBC iPlayer, ITV Player, All 4 (formerly 4OD) and Demand 5. Netflix and Amazon Video are there too, to complete the streaming family. The core features work just fine. Freeview Play is a little stuttery right now, but it’s early days. That said, we find the machine to be a bit sluggish in operation. Just playing a Blu-ray is fine, but switching between modes or simply skipping through the menus is a slow process. We get the feeling Freeview Play needs to be better optimised. The Panasonic DMR-BWT850 is a small box with a big list of tricks, but we can’t help wonder who it’s being aimed at. With great Blu-ray players going for less than £150 these days, and a 1TB YouView box currently on sale for £200, the purchase of these two machines will give you all the streaming action you need. That leaves the Blu-ray ripping element, which is a very niche demand, and we’re not sure it justifies spending an extra £220. We commend Panasonic for making this all-in-one box of tricks, which no doubt some people will find useful. However, it’s no cheap option.